LA SELECCIÓN DE ALEMANIA NO PODRÁ CONTAR CON MICHAEL BALLACK EN EL PARTIDO DECISIVO CONTRA BRASIL POR CAUSA DE ACUMULACIÓN DE TARJETAS. LA SELECCIÓN BRASILEÑA VENCE A TURQUÍA 1-0 CON UN GOL A LOS CUATRO MINUTOS DE LA SEGUNDA PARTE CON UNA APARICIÓN DE RONALDO POR EL COSTADO IZQUIERDO CON UN DISPARO QUE DEJA SIN NINGUNA POSIBILIDAD AL ARQUERO TURCO. 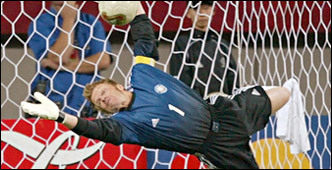 EL PORTERO ALEMÁN OLIVER KAHN ESTA EN SUS MEJORES MOMENTOS YA QUE SOLO LE HAN PODIDO ANOTAR UNA VEZ EN TODO EL MUNDIAL Y ACTUALMENTE ES EL MEJOR PORTERO DEL MUNDO.